The Cabled Array and sections of the Endurance Array use Primary cables to distribute power from land to sea and to provide two-way communications between OOI operators and the undersea platforms and instruments. Currently up to 10 kW of power and 10 Gigabits/second bandwidth are distributed from the Shore Station to subsea terminals (Primary Nodes) located off Newport Oregon, near the Cascadia Subduction Zone, and across the Juan de Fuca tectonic plate to Axial Seamount, reaching ocean depths as great as 3,000 meters on the Juan de Fuca tectonic plate. 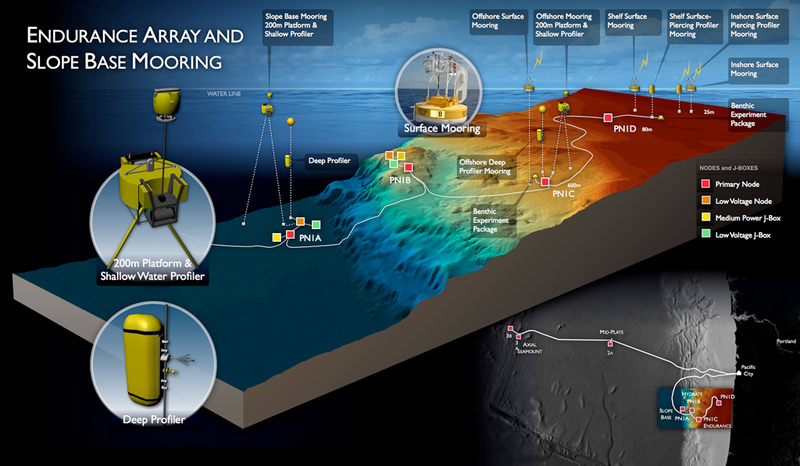 Primary Infrastructure distributes power and communication from the land-based Shore Station in Pacific City, Oregon to sub-sea terminals (Primary Nodes) at depths of up to ~3000 meters across the Juan de Fuca Plate. The Primary Infrastructure is made up of several components, beginning with the Backhaul System and infrastructure within the Shore Station. The Backhaul System provides Internet connectivity from a CyperPOP (cyber point of presence) in Portland Oregon, to the Shore Station. The CyberPop provides some data storage, but predominantly serves as a data-video imagery routing station to distribute two-way information over the Internet in real-time. The Shore Station houses Power Feed Equipment to convert utility power to high power (up to 200 kW) regulated and controlled power for each of the submarine cables that runs from the Shore Station into the ocean. Also included in the Shore Station is Line Termination Equipment that contains the optical drivers and receivers for the submarine cables that terminate in the Shore Station. A Cable Landing provides the transition for the submarine cables from the ocean bed through buried conduits to the Shore Station. Connecting the Shore Station to the Primary Nodes are approximately ~900 km of Backbone Cables. Backbone Cables are fiber-optic telecommunication cables, a telecom industry standard, known for long lifetimes. One cable extends south from the Shore Station to the Slope Base and Hydrate Ridge sites, as well as the to the Endurance Array. The second backbone cable extends across the Juan de Fuca tectonic plate to the Axial Seamount study site on the Juan de Fuca Ridge. Primary Nodes provide high power (8kW) and high bandwidth (10 GbE) two-way communications between instrument arrays and the shore station. They are also are distribution centers for extension cables that provide power and communication to sensors, instrument platforms and moorings for continuous, real-time interactive science experiments at the seafloor and throughout the water column. Each Primary Node houses a Medium Voltage Converter that converts the 10 kVdc primary level voltage to 375 Vdc levels. Power (375 V) and communication (1 GbE) are distributed from Primary Nodes to secondary infrastructure (Low- and Medium-Power Nodes) at science work sites through extension cables connected to scientific ports on the nodes. Additionally, each Primary Node has two science ports that allow power and full bandwidth (10GbE) connections to specific devices, such as high definition cameras as well as one expansion port to send full power and bandwidth over long distances (>200 km) to other instrument locations. The Secondary Infrastructure includes all extension cables, Low-power and Medium-Power junction boxes, low voltage nodes, six water column moorings, and seafloor and mooring sensor packages. The extension cables link this infrastructure to the Primary Nodes. Cabled Array secondary infrastructure consists of 18 Medium- and Low-Power Junction (J) Boxes and Low-Voltage Nodes that distribute power, communication, and timing to instruments. Whether an instrument is connected to a Medium- or Low-Power Junction Box depends on the power requirement of that instrument. Medium-Power J-Boxes are connected directly to Primary Nodes through extension cables and receive an input voltage at 375 Volts DC and an input data link at 1 GigE. Each junction box has eight instrument ports that provide 12 to 48 V and has 10/100BASE-T, RS232 or RS485 data links. Low-Power Junction Boxes are connected to Low-Voltage Nodes and have an input voltage at 48 Volts DC and an input data link at 10/100BASE-T. They also has eight instrument ports that provide 12 to 48 V and has 10/100BASE-T, RS232 or RS485 data links. Instruments providing data on water column properties are located on the seafloor and on Deep and Shallow Profiler Moorings. These instruments, coupled with those to collect data on seafloor and biological processes, total 140. Power and communications are provided to secondary infrastructure and instruments via 61 km (29 km buried) of extension cables. Ports are configured pre-deployment and include wet- and dry-mate connectors and are maintainable by remotely operated vehicles (ROV). Expansion ports provide “daisy-chain” capabilities via extension cables, thus making the system highly expandable.